Some Japanese carmakers consider leaving Vietnam for other regional markets with better business prospects, said Takimoto Koji, the chief representative of the HCM City Office of the Japan External Trade Organisation. According to Takimoto Koji, Japanese carmakers want to leave Vietnam for Thailand or Indonesia as the Vietnamese market seems to be becoming less attractive to them. 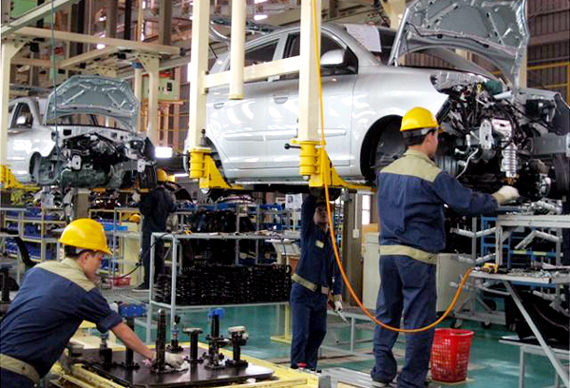 Vietnam’s auto production supporting industry sector has seen the little improvement in the past decade, meanwhile the local localisation rate has remained low; so, the majority of auto spare parts must still be imported, Koji said. He added that the supporting industry in Vietnam only meets a small part of Japanese carmakers, so they have to choose to import and re-sell cars, instead of basing their production activities in the country. Car production capacity in Vietnam stands at roundly 250,000 units per year against more than 2 million in Thailand. Meanwhile, car plants can only be profitable with a minimum capacity of 200,000 units per year. Japanese carmakers of Toyota, Mazda, Honda and Suzuki are currently operating in Vietnam, Koji said; he, however, did not disclose which consider leaving Vietnam. Koji also said that 60% of Japanese firms in Vietnam complained about their business difficulties in the country related to weak infrastructure, and cumbersome and complicated administrative procedures.